Two men have been sentenced to more than 30 years in prison following a £1m armed robbery at Fattorini jewellers in Harrogate in 2014. David John Patmore, 32, and Shaun Booth, 29, pleaded guilty to conspiracy to steal and were jailed at Teesside Crown Court today for 19-and-a-half years and 12 years eight months respectively. Staff at Fattorini jewellers in Parliament Street, Harrogate, were setting out stock when four masked men struck, just after 8.30pm on December 4, 2014. Three members of the gang piled out of a Vauxhall Vivaro van brandishing axes and machetes then smashed their way through the front door Harrogate using a battering ram. Shop staff fled to the back of the store but had to leave the safe open as they rushed for safety. The raiders filled a large bag with high-end jewellery, including necklaces, rings and Rolex watches with a total value of around £1 million pounds. They made off in the van but changed into an orange Ford Focus ST performance car as police pursued them. The gang collided with several vehicles as they drove towards Leeds at high speeds. When they were brought to a halt, they carjacked another white Vivaro van by threatening the driver and passenger with weapons. The van was crashed a short distance away and the occupants attempted to carjack a BMW and a Jaguar before stealing a black Vauxhall Corsa in Leeds, which was recovered in Beeston, south of the city, three days later. North Yorkshire Police launched a major investigation in which they worked closely with forces in West Yorkshire, Manchester and Cleveland. The investigation led police to the North West and resulted in the arrest of Patmore, of Oldham, Lancashire, and Booth, of Blackley, Manchester after detectives linked them to the Harrogate incident by trawling huge amounts of phone records and other data. They were also linked to a bigger criminal network involved in other major thefts, including robberies at jewellers in the Cleveland area. This was also reflected in the counts they faced and the sentences they received. Nine other people from Greater Manchester and Teesside were arrested for their role in the network. They were sentenced alongside Booth and Patmore. 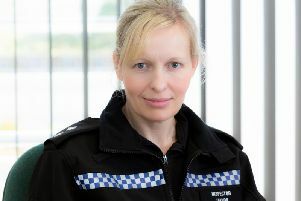 Detective Constable Leah Wallhead, who led the investigation for North Yorkshire Police, said: “These men were connected to an organised crime gang that was prepared to take massive risks, and ruthlessly endanger innocent members of the public in a bid to line their own pockets. “Throughout this investigation, we worked closely with other forces including Cleveland and Greater Manchester, to painstakingly gather evidence and link them to a major criminal network that operated across the north of England.